Review based on use and experience with iPad. Need to do some waveform editing? Twisted Wave Audio Editor has you covered. 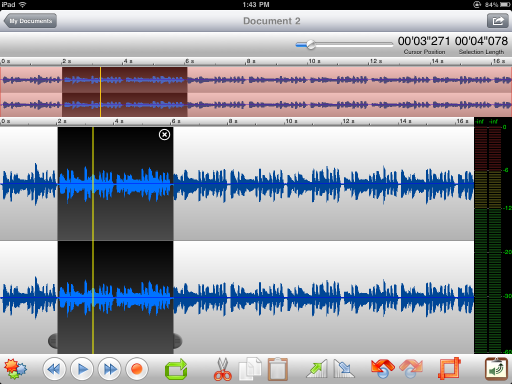 Twisted Wave had been my most used audio editing app for a while. Now it supports Audiobus and multiple sample rates. The addition of Audiobus support is what I’ve been waiting for. The design of Twisted Wave is tried and true so no need to really change much of my original review. It does the job, and does it very well. Its still the first app I recommend to folks for editing. With all the necessary editing functions and more, there’s a lot you can do to twist up those audio files in a number of useful and fun ways. Thanks to copy paste, iTunes File Share, importing from iPod, bringing in those files to edit is easy, and convenient. You can also record audio directly using your device mic, or if you have an external mic that works too. Thanks to a clean and easy to navigate interface getting your work done will not be any hassle. 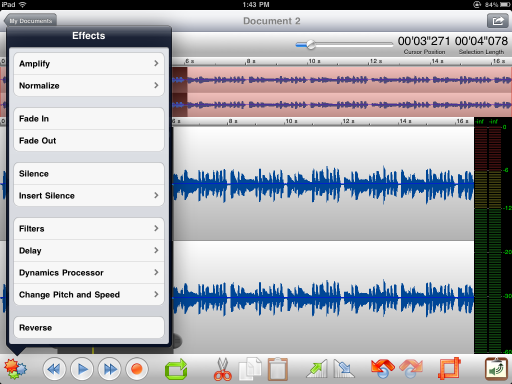 The work area shows the loaded, complete waveform and responds nicely to the touch. Cut, crop, loop, and apply effects in real time. Make a mistake? No problem you can undo it. Or redo it too if you wish. There is the option to create a whole new document as well. Twisted Wave has a nice selection of effects like fade in or out, delay, compressor/limiter, pitch shifting and time stretching, Dynamics Processor and more. If your file is too quiet or too loud you can adjust the levels in great detail, or amplify or normalize it to a level you choose. The filter effect adjusts high or low frequencies for nice effect. Playing with all of these in various settings can produce some cool new sounds on your file if you wish to really twist things up. It all works well, and I find these functions to be deep and useful especially in various combinations. Spec listings aside, and you should check iTunes app store for the complete list, it’s all about quality and results. Both are present in Twisted Wave. My experience with this has led to producing some great audio to use in my music. Ive been able to improve things and change others altogether in ways I hadn’t really given a lot of thought to before. If you want or need to, you can chop up a file with parts that are reversed, inserted silence, Dynamics Processor adjustments, FX, etc and piece it all together again. Then when it’s all done open it in another compatible app. It’s a great tool to have, and I don’t know how I got by without it? Having always relied on built in waveform editors in various studio type apps I never thought I’d need a single dedicated waveform editor. Until now. I’m glad I got this, and I recommend it highly. I must point out that while Twisted Wave is very good, it’s not without faults. Copy paste doesn’t work properly on my device with the latest iOS update. I learned a work around by just turning off WiFi on my device. Occasionally I have heard unwanted artifacts, but this again may have something to do with my version of iOS (4.3.3) installed on my iPad, and I have noticed the artifacts are not present in the actual file. Just listen carefully, adjust things as needed and have fun. Another great write up my friend. I am glad to see another review posted. I too have had great results with twisted wave and it has sped up my workflow considerabaly. Everything I record from other apps such as horizon,synthx,or molten,go straight through twisted wave to edit out the count ins,adjust end time,and help with better fade in/outs. I didn't have any of the 'bugs' with wifi as you did but I am running 4.3.2, with the latest iOS offering in iTunes being 4.3.3. I guess I am glad I didn't upgrade yet!The iPad does have trouble with live delay and pitch shift/stretch and you will get considerable noise and artifacts during 'preview'. Although I have taken the leap of faith and hit apply many a time to find the end result to be void of any and all sound artifacts that were produced during the "preview" phase. I was not to fond of the time stretch/pitch shift effect as it turns out very badly. The sound that is produced makes all normal sounds have a digital 'clang' to it almost as if there is digital bit crushing that got mixed with the proceedings. I still found this to be a great addition to anything recoded on my iPad that ends up needing adjustment. It serves it's purpose and without being directed to it in the app store it would have been sorely missed in my situation. Thanks for the heads up as always and look forward to more reviews! Later. freesoul.